San Bernardino County is a county in the U.S. state of California. The county seat is San Bernardino and it is considered part of the Inland Empire region. 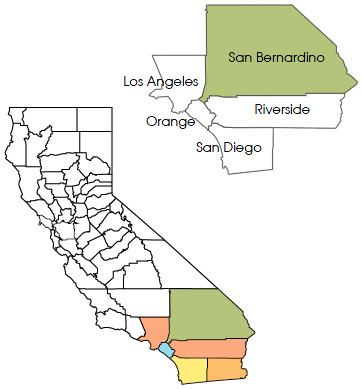 With an area of 20,105 square miles, San Bernardino County is the largest county in the contiguous United States by area, larger than any of the nine smallest states, and larger than the four smallest states combined. As of 2009 the county’s population was estimated to be 2,060,950. Located in the southeast California, the thinly populated deserts and mountains of this vast county stretches from the outskirts of the densely populated Riverside-San Bernardino Area to the Nevada border and the Colorado River. The median income for a household in the county was $42,066, and the median income for a family was $46,574.